In case you missed the bombardment on my IG feed about the Cosmo/max event, then this blog post could be for you. I wore this outfit to the Cosmopolitan and Max Fashion Icon Delhi Finale which was held at The Kila, Delhi.It was my first time visiting this place, and I assumed it would be freezing as the fashion show should be outdoors, and I was right. Well It's rewarding if one trust their Gut and that just saved me too from freezing in outdoors as I picked up this Wool sweater to wear.I was in a mood to emancipate the Rock Chic Glam avatar that day, and added a spike cuff to match along the Studs(diy) on my shoulder.I picked up these cute mickey print pants from Bangkok on my last trip,but couldn't find them ever in the unending chaos of my closet clutter.Later I saw them hanging when I was looking out for something else and this outfit happened.Besides unleashing the Rock chic archetype, we had a lil fun shooting these photos too ! I wiped out a whole box of rum chocolates before leaving . Hubs says it reflected in the pics ? Unshackled much ?? Do you think so too ? 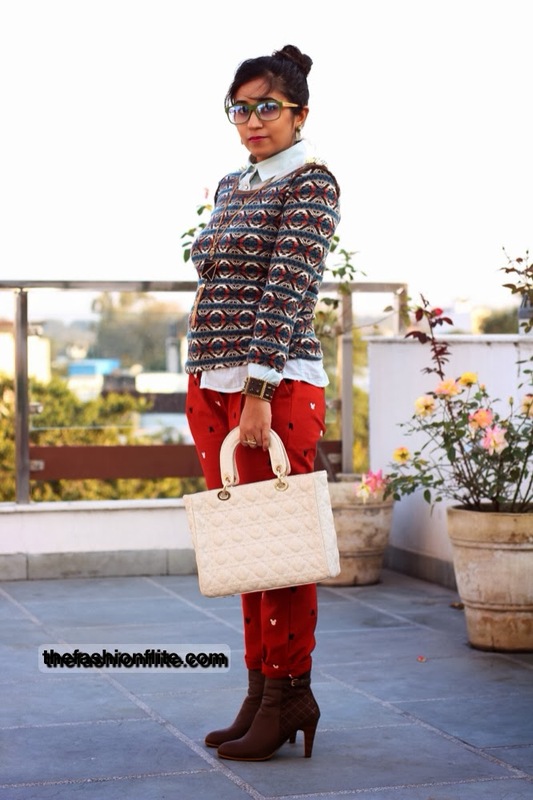 Wow I love how you mix prints in this outfit, lovely pants by the way! Absolute Genius Surbhi..u nailed it. What a fun and quirky outfit! I love the red jeans and jumper! Sounds like you had a fab time and I hope you have a nice weekend. brilliant look!! i love love love it! Look at those pants ? 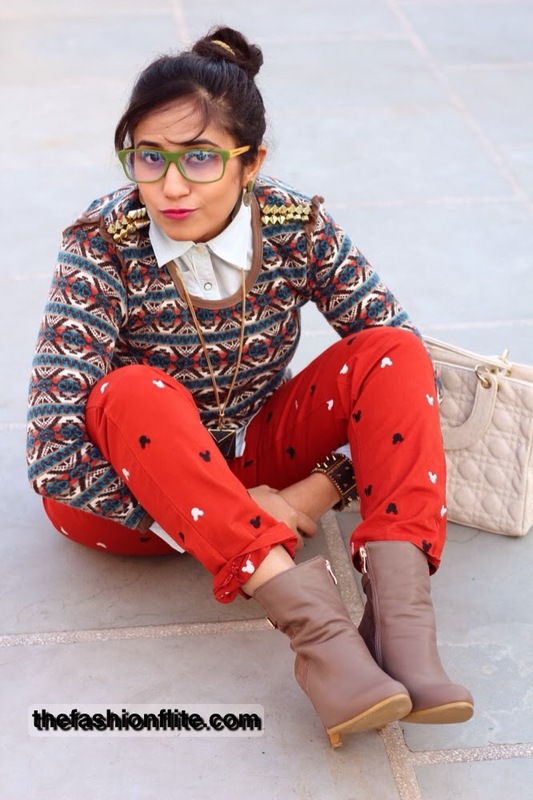 :O Total love and chic <3 Oh and btw you have an impressive blog :-) New follower from Sana's Fashion Ramblings. Its always been so nice to meet with a person who shares the same passion like me . I love the print clashing here! The studs are such a clever addition indeed:-)) Very quirky and absolutely well styled for the occasion ..I have this urge to go and shop at Bangkok too after I look at your goodies! I adore this mix of prints! Surbhi! You look quirky! Too good!!! 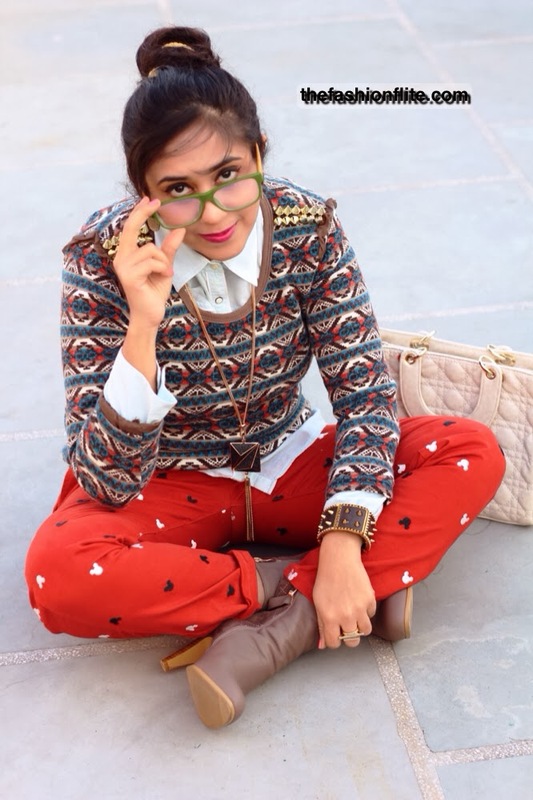 Love your pants, boots and glasses the most! You look adorable in these pictures!! I love pants and bag! So cute, love the print! LOve the sweater....!!!! And I love how you are carrying this look....especially the glasses! That pants are so cute. so cute and really love your outfit!! You were very creative, I love the outfit you chose for the occasion! Oh my I LOVE that top!! And the event sounded like a great time, wish I could have gone. You look absolutely adorable, I love your trousers! Love the pants, so original!! Amazing pants !! so cool. Great look! Love the sweater and the glasses! I really really like your pants!!! Nice post :) Would you like to follow each other via Bloglovin? Love your sweater. Cute post I love your funny faces! Super great look, love your pants!! Lovely your look is perfect for you! thats a really cute outfit! !